According to the dictionary a freak is defined as any abnormal phenomenon, the definition of a bass is a an instrument that produces tones in a low register. If you combine the 2 words together with a little miss spelling i.e. you get Freekbass. Freekbass is, at least to the world of music and musicians, exactly what the name implies. 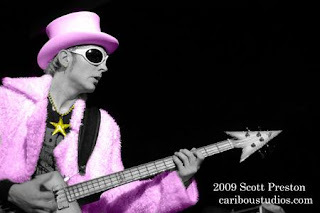 A phenomenal bass musician. Having the opportunity to sit down and talk to one of the funkiest bass players was an absolute thrill for me. Freekbass is one of those guys that has his feet firmly planted on the ground. His music is full of funky cool beats and rhythms. While talking to him I could quickly see he is a "glass half full" person, he knows what direction his career is going and there is nothing that stands in his way. FB has taken advantage of about any chance or opportunity that has come his way that he felt would be right for him. Because of the length of the interview I have split it up into 3 parts that will be posted over the next several days. In part one we talk about baseball, his musical influences and of course how he go that name Freekbass. Rock House Blog: Let’s forget about the music stuff for a minute and let’s talk baseball. It’s no secret that you’re a huge Cincinnati Reds fan. Freekbass: Yeah, you know I don’t even think my parent’s voices were the first ones engrained in my head. There are 2 iconic announcers here in Cincinnati. One is Marty Brennaman and the other is Joe Nuxhall who just passed last year. I remember hearing those voices back as long as I can remember. RHB: There’s a ton of history that goes with Cincinnati and baseball. FB: I don’t know if you know it or not but Cincinnati was the first town that had major league baseball in it. They had the first professional baseball franchise so it’s pretty engrained in the culture here for sure. 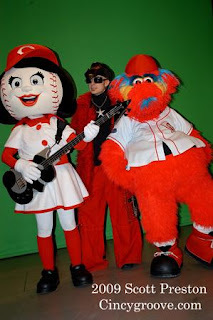 RHB: You did a music video for the Reds not long ago, tell us how that came about. FB: Well, the Reds got in touch with me a couple years ago. They were putting together this CD called Cincinnati Clutch Hits and the Reds have this thing called the Reds Community Fund which basically raises money for different baseball parks in inner cities. The fund helps buy equipment like bats and balls and they give money to help keep the fields looking good, so they had different artist do songs for this CD and the song Reds Fan kind of gained a little steam. So they said how about we do a video for the song. We went down to the ball park and they shot the video and put it together. All last season when they won a home game they played Reds Fan at the end of the game. I had the honor of throwing out the first pitch last year which was really cool. For being a baseball fan it was definitely a dream come true. RHB: Tell us about the song. FB: It was a song that was so easy to write because I just basically wrote about being a Reds fan. One thing I tried to consciously do when I was writing the song was not date the song with players’ names and stuff so it would have a little shelf life. I tried to speak of the team from a fan prospective so no matter what era it was, the song would work whether it is played now or 10 years from now. To be able to do that was one of those unexpected pleasures that comes along once in a lifetime. We were doing a show at the park last season and they were playing the Chicago White Sox. I play the Chicago area quite a bit and had a lot of Chicago fans come up to after the game and ask when I was coming back to Chicago to play, so it’s been good for me. RHB: It’s cool to think the song may be a part of Reds history, I mean think about it they may be playing Reds Fan 30 years from now. FB: That would be fantastic and I would be totally honored. I was just really honored to do the song n the first place but each season it just keeps lasting another year, I’m thrilled. RHB: I could talk baseball all day FB but I think I better get onto what the readers want to know about so let’s get into you and your music. What drew you to funk were your parents into funk? FB: Yeah, well my Father was a huge Joe Cocker fan and he used to listen to Janis Joplin. My parents played the Jesus Christ Superstar sound track a lot. But obviously they listened to a lot of James Brown as well as some of the early Funkadelic stuff. They would listen to rock stuff too. My Dad was into Willy Nelson. My Mom was more into Elvis and The Beatles. When I was a real little kid my Mom used to dress me up as Elvis on Halloween , so I guess that’s where my fashion sense started to develop (laughing)my style must have come being dressed up as Elvis too many times as a kid. I guess you could say I got the fashion sense from my Mom and the musicality from my Father, he played a little guitar as well so that had something to do with I think. RHB: So then why the bass? FB: Well, I originally started off as a drummer. When I was a real little kid, like 4, 5, 6 years old I would always have that little rhythm thing going on. If you were around me I was always banging on something, you know pots and pans or if I had a couple spoons I was a happy kid. So I started off on drums and then played a little bit of guitar but when I was in Junior High I went to a music school up in Northern Ohio called Overland College and they had their jazz band come to our school. I remember it so distinctly because I happened to be sitting right in front of the bass player in the band and I heard the sounds that were coming out of that instrument and I was like instantly drawn to it. I was like wow, that’s what I got to play. I loved the depth of the strings and the rhythmic aspect of it, the chunkiness of it. You know when I play guitar, which I still play as well, it always feels so delicate to me. Like I’m going to break it (laughs). But I like the bass because it’s chunky and it has that low end and it’s rhythmic so for me being a drummer at the time it turned out like being able to play drums but with notes. But then growing up in Cincinnati, you know, Cincinnati has always had this huge funk history here. Going all the way back to the 1960’s James Brown started here, King Records is here which is where James Brown did his songs in the 70’s and then of course there’s Bootsy. In the late 70’s early 80’s you had Zap and bands like The Midnight Star, The Deal which Baby Face came out of. There has always been this really rich history of Funk, R and B, and rhythmic music. RHB: So those were obviously big musical influences for you. FB: Yeah, People always ask me if I grew up in a different part of the country if I would be playing music. I’m sure if I grew up somewhere else I would still be playing music but I don’t know if I would have the funk influence that I had when I was a kid. You know like Zap coming out of the boom box and you hear that bass just throbbing and pulsating. Again it goes back to that Jazz band I saw at my school. I was just always drawn to that sound. 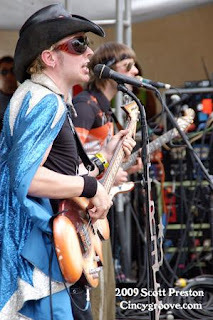 Most of my friends were into the rock kind of stuff like Nirvana and Sound Garden and bands like that, but I was always kind of drawn to the funk thing. So that’s kind of how the whole evolution of Mr. Freekbass began. RHB: And Bootsy Collins how did he come into the equation? FB: Now that was just unreal. I remember I was probably like 3 or 4 years old man, I can’t even remember, but I do remember being in a store downtown called Newberrys. It was kind of like a record store / Target. I remember being in there and I saw this poster, like one of those cut out posters of this giant man, with this giant bass, that looked like a super hero. I was like wowwww (laughs) and I just stood there staring at it until my Mom grabbed me and said lets go. 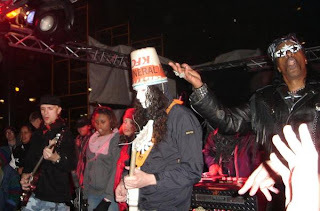 Of course at the time I didn’t know that it was Bootsy, years later when we met it was kind of like a weird déjà vu thing. But the way that we met was there was this singer Gary Cooper, whose nick name is Mud Bone and he was doing some demo work for a label out of Japan called P-vine records, which is mostly a Funk / R and B label, they were putting together a Jimi Hendrix tribute record. It was a record with songs that were written about Hendrix by people that were influenced by him in the Funk scene. I think Earth, Wind and Fire were doing a track. The Ohio Players were doing a track as well as George Clinton. Anyway, Gary, Mud Bone and Michael Hampton who was one of the main guitar players from Funkadelic were doing a track and Mud Bone had asked me to play bass on it. I had done some demo work with him and he had heard about me from playing gigs in Cincinnati. Mud Bone told me that Bootsy was going to produce and engineer it and I was pretty much just taken back by that. I said to him “what did you say”? (laughing) So he brought me up to Bootsys’ studio and Mud Bone, Bootsy and I just hit it off from the start. We started talking about things like equipment and we just connected. I guess it was a week or so later Bootsy called me up and he started inviting me to his studio and we started writing songs together. At the time I was already touring with a group called Shag which was another Funk band. So when the name Freekbass started I thought it was going to be more of a studio project. You write a bunch of songs and put a record together. RHB: And that’s how it all started? FB: Well, Shag started to slow down. Some of the guys were getting burned out from being on the road. So I thought I would like to play some of these songs I worked on with Bootsy live so I started playing a couple shows in Cincinnati and then did a couple shows around Columbus and then down in Louisville Kentucky. The circle just kept getting bigger and bigger. Then I got picked up by an agent out Michigan and we did more of the Greater Midwest and then that branched out to offers on the East and West Coasts. It eventually became time to move onto more of a national agent and that’s when we hooked up with Simon Says Booking out of Boston and we started touring where ever they would have us, kind of nonstop. In a nut shell that’s kind of how the whole thing blossomed. In part 2 we talk about why he chose the bass guitar, more in depth talk about his career and the state of the music business today. Get notification of part 2 of this interview by hitting the subscribe button at the top of the blog. Great start.... are the other two parts up yet????? HAHAHAHA!